We've got gobs of great Co-Ed Couples Baby Shower Ideas for you! Attending a co-ed "couples baby shower", or "Jack and Jill" shower is so much fun! It tends to be more laid back and full of laughs! Men may be a bit skeptical at first, but they usually end up having a blast! They get to mingle with some guys, drink a little beer, smell some "dirty diapers" (I'll explain later) and eat some great food! Be careful not to make it too much fun or they may want to attend all of your future "girl" events. As the hostess, it is your job to make sure everyone is comfortable and having a good time. Below are some cutting-edge ideas to make your shower a hit! A Bun In The Oven And Burgers On The Grill! 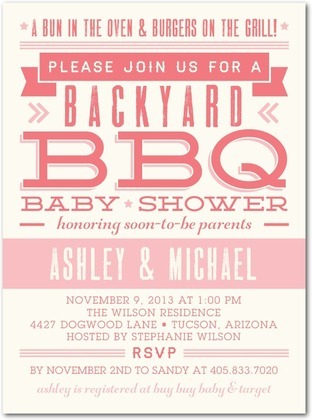 The perfect baby shower invitation for a couples baby shower! Bring You Hubby, Come Celebrate! It's a Couples Baby Shower...Don't Be Late! Come to A Baby Shower, Bring Your Spouse Too! We'll laugh, we'll chat, we'll BBQ! 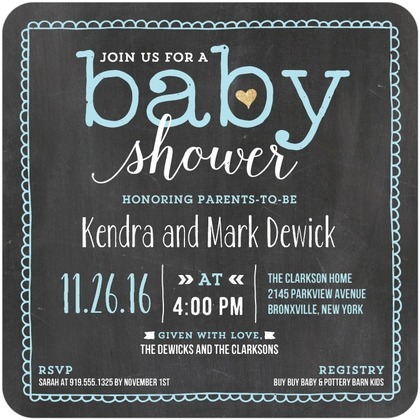 Couples baby shower games are easy to plan and take the awkwardness out of the event! If you haven't had the chance to experience the new trend of "couples baby showers" they are pretty fun! So go ahead, choose a few games and have a blast! 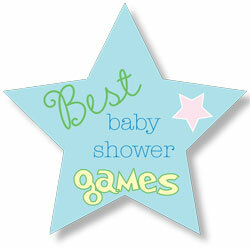 Dirty Diaper Game - The first of our couples baby shower games requires a keen smelling sense. Using a Sharpie pen, number 6-8 disposable diapers. Melt or smash different kinds of candy (such as M&M's, Snickers, Baby Ruth, Reese's Peanut Butter Cups) into each diaper. Pass the diapers with the smashed candy around the room. Each guest must examine and smell the contents of the diaper to determine what the candy it is. They then write down which candy bar they think is on each diaper. The guest with the most right wins a prize. Have your camera ready for this game, you will get some priceless pictures! Big Balloon Belly Race - This is an excellent co-ed or couples baby shower game idea! Blow up some balloons and have all of the men and women in the room put one under their shirts. Then have a race to see which one of them can tie their shoes the fastest! The winner gets a little prize. Beer "Bottle" Game - This game is a little challenging. But it is a great icebreaker. The men at the shower may be feeling a little out of place. This one should loosen them up a bit. Fill several baby bottles full of beer. Hand each one of the contestants a bottle, and say ready, set, drink! The guest to finish his/her bottle first is the winner. You can substitute juice for those who don't want alcohol. Wet Diaper - For this game you will need to break up into groups of 3-4. Give each group a disposable newborn sized diaper, a large pitcher of water and a measuring cup. Have each group predict just how much water they think the diaper will be able to hold without any water leaking out of it. Have them write down their prediction before beginning. The group who comes the closest wins a fabulous prize! Have each couple stand side by side, shoulder to shoulder. Give each couple a baby doll and an outfit to dress her in. Have the man use only his right hand and the woman use only her left hand to assist each other in dressing the baby. This is a hard one, but so funny! Jazz up your Couples Baby Shower by giving your guests some extra-cool Couples Baby Shower Favors and Prizes! We found some great ideas that can be used for both Prizes and Favors! Buy a chocolate fountain and have guests dip fruits and cakes in it! Make or buy sugar cookies in cute shapes such as baby bottles, tools, sports shapes, animal, etc. Kind of corny - but you could have a baby-themed pinata for the guests to hit. Guys love feeling like kids again! 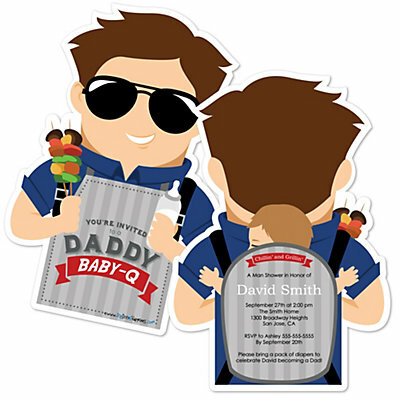 For Baby-Q Co-ed or Daddy baby shower invitations, click here. 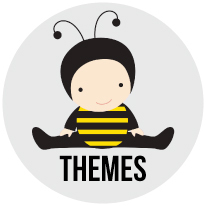 We have come up with dozens of cute baby shower themes! 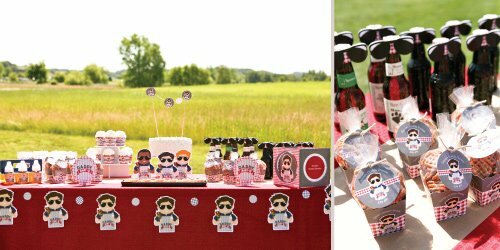 Some perfect themes with "Couples Baby Shower Ideas" are a BBQ baby shower, a sports themed shower, a safari jungle shower, or a cute farm animals baby shower! See them all here.